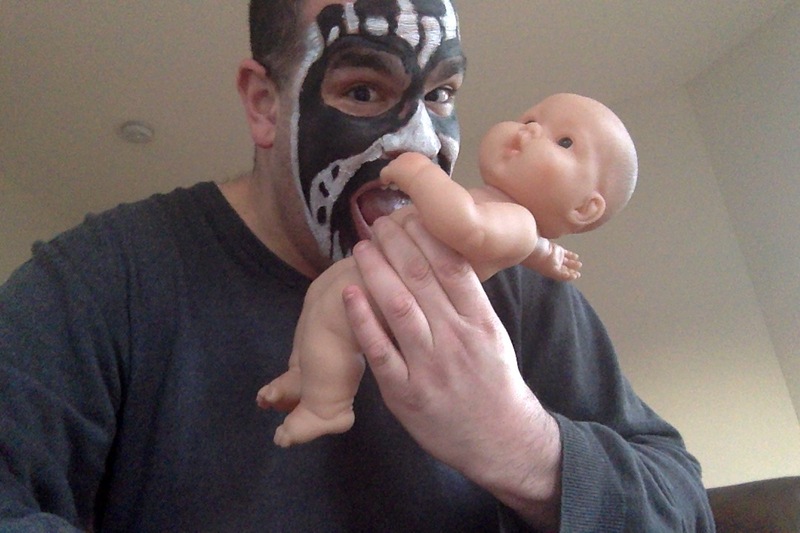 I’ll admit it; I’m probably not the most normal person on the planet. Some would say there is no such thing as “not normal”. They have never encountered a 39-year-old man pretending to be King Diamond at a Quik Trip gas station trying to buy a chocolate chip muffin and a Pepsi. 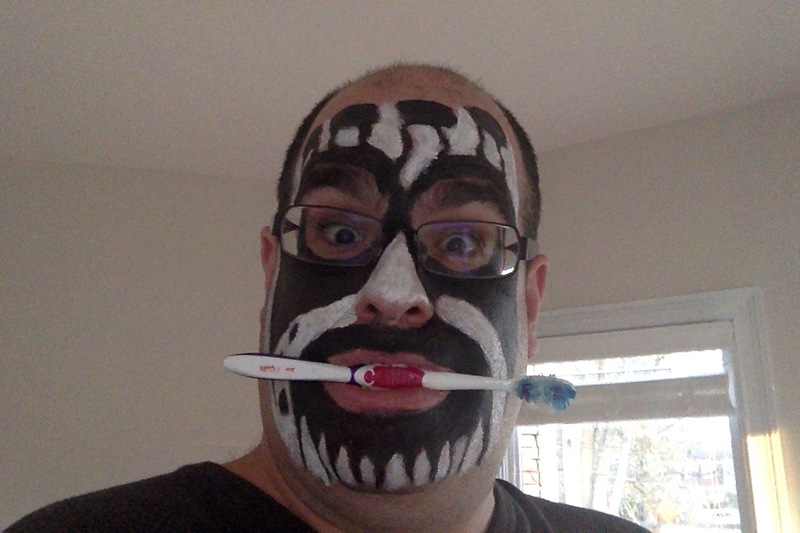 For a very long time, I have wondered what it would be like to walk around a major American city in King Diamond paint for an entire day. I’m not sure what started the wheels turning on this one for me. 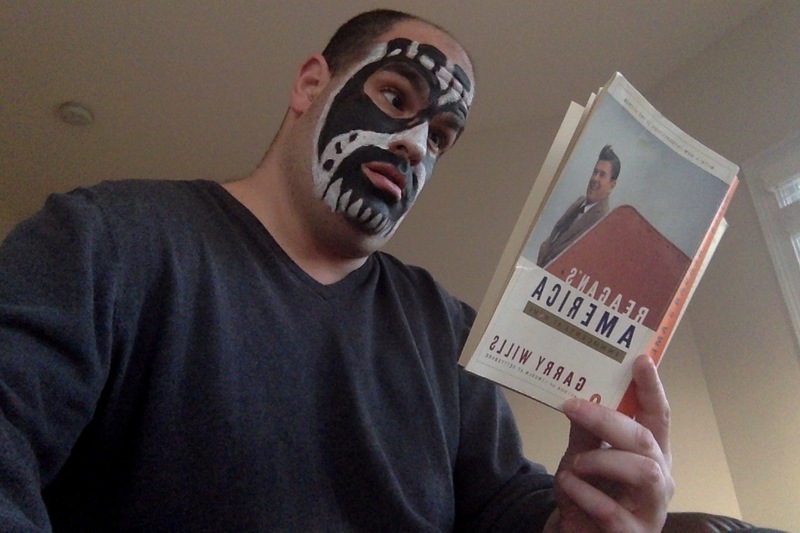 I never particularly liked mimes or really anyone who wears large amounts of face paint. 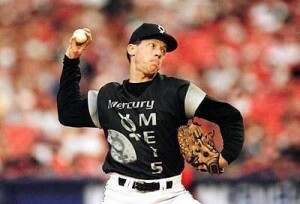 I’m a moderate fan of The King. I’ve gone through phases where I listened to a lot of his music, but I’m certainly not like the guy who was standing next to me at the 1993 Halloween concert holding a wooden cross upside down and chanting in tongues for 20 minutes before The Man got up on stage. The transformation process was a bit strange. 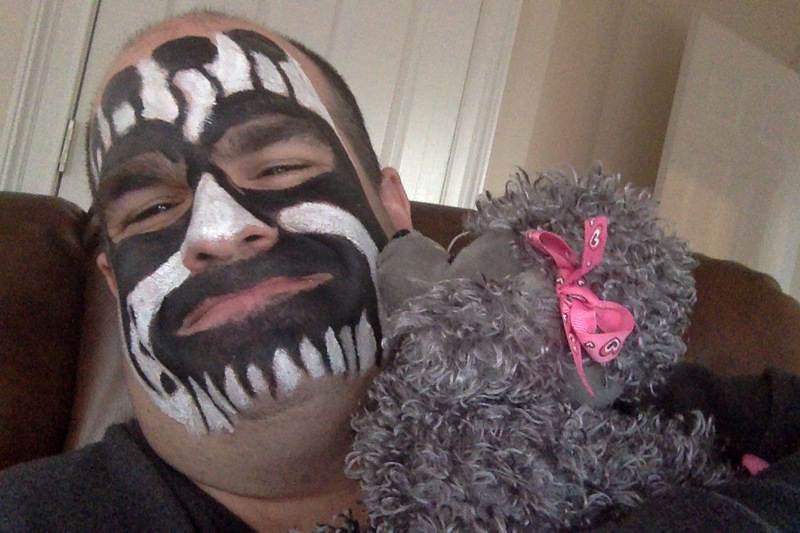 It took about 45 minutes to get the makeup right. I sat there listening to “Don’t Break The Oath” staring off into space as I was painted. I once wore rouge for a 5th grade presentation of Annie in which I had a brief role as one of FDR’s advisors (Harold Ickes), but beyond that, I had never gone through the process of having makeup applied to my face. It’s uncomfortable. I immediately felt empathy for clowns, particularly this one woman “Miss Teacup” who I once met while she waited for the tow truck to come pick up her broken down Toyota Tercel. She was standing there in 95 degree heat wearing about a half of a pound of makeup frantically trying to contact the family of the child whose birthday party she was supposed to be at. If I knew then what I know today, I would never have stolen her purse. There were really only a few noteworthy encounters. One person started singing “Rock and Roll All Night” when they saw me. I was unamused. Being mistaken for Gene Simmons under any circumstances is offensive to me, but the metal purist in me wanted to throttle the person. Another person asked me if I had any Faygo. You can imagine the horror I felt. My co-workers were relatively amused, but it was laughed at and quickly forgotten as the business of life ground on. There are these Pro-Life protestors that I regularly see on the drive home with signs that read things like “It’s A Baby, Not A Choice” and “I Survived The American Holocaust” camped in front of the local Planned Parenthood. I had an elaborate scheme planned in which I leaped out of my car and began screeching the lyrics to “Abigail”. Unfortunately, they were not there and my rather uneventful day as The King slogged on. I kept casting glances out of my car window at people who I intended to frighten. No one seemed particularly impressed or even remotely affected. A minivan cut me off in traffic. I drove up right next to the car and gave the driver an angry look. He cast a brief eye in my direction then went back to text messaging someone about whatever urgent thought had just occurred to him. I assumed that my stop to get gasoline would be the highlight of the day. Someone would have to find this at least a bit out of the ordinary. Again, disappointment. I stood behind my car pumping gas. People walked by. Some looked, some didn’t. No response. I went inside to the cash register. The person whose named tag announced him to be “Tim” looked took my 20-dollar bill and gave me change. Nothing. Was this an ordinary occurrence at gas stations throughout the American South? Was this odd attempt to garner attention not particularly interesting or funny? Was I misreading the body language of the people around me? Were people simply so locked into the everyday drudgery of their lives that a 6 foot 2 man in heavy metal makeup could not even awaken them from their daily slumber? I wasn’t sure. I slumped back into my car and drove home. My wife and children found the whole thing pretty funny, but considering I regularly run around the house with a pair of pants on my head or singing Soviet Era march anthems, it didn’t really strike anyone as being out of the ordinary. We took some pictures and went back to our usual routines. Life seems to march on unmoved by the bizarre actions of myself or anyone else. When something truly out of the ordinary occurs they might ponder it. For a moment. Sometimes. Life has an energy of it’s own. It flows in 7 billion directions all at once. Everyone in their own lanes. Everyone going somewhere. Doing something. Thinking. Breathing. Talking. Texting. Chewing. It all just goes on and on. Day after day. Night after night. There is no universal theory to explain it. It’s just one event after another. An endless parade of sights and sounds. 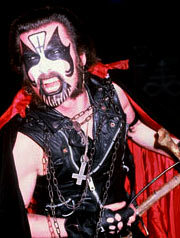 What is the importance of one man wearing King Diamond makeup in this sea of human impulse and action? Very little. Throughout the entire day, I felt this odd pressure to be noticed. As if it was critical that someone see me, see what I had done. To laugh. To be altered from their course. At first, I was kind of bothered that no one really seemed to notice. After all, what was the point beyond seeing the shocked expression on a few faces? As time went on, I just wanted to get the makeup off. I was tired of showing off. Tired of playing a part. Exhausted by trying to be noticed. At the end of the day, I felt a genuine sense of relief to take the makeup off. 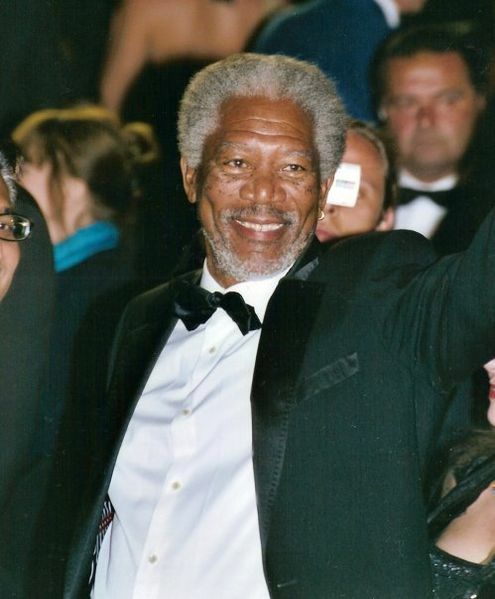 I’ve always felt it important to stand out as an individual. I’m narcissistic enough to have spent four years writing random thoughts and ideas on this website and hoping desperately that people will want to tune into my world enough to read it. I enjoy the thrill of being noticed. Until yesterday, I had never realized how tiring searching for it can be. The best part of the day for me was when I sat alone in the deadening quiet of my bedroom right before I fell asleep. No one was watching me. No one cared what I was doing or how I was doing it. Silence. For a fleeting moment, I felt the genuine peace of not being an individual, but simply being. I sunk into life and disappeared. It was beautiful. In 2016, everyone’s favorite Metal Monarch is coming to the Motor City. Universal Studios, The Ford Motor Company and The Church of Satan will spend 1.3 billion dollars to build the greatest American attraction since the creation of Disneyworld. 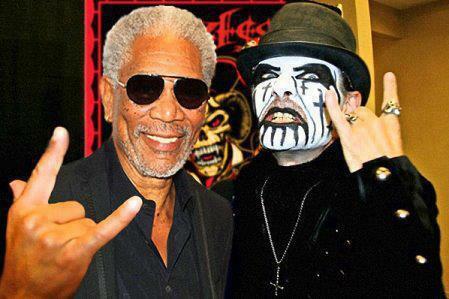 King Diamond’s “Them” Park is expected to bring millions of visitors from around the world all hoping for a mindless diversion from the crippling sense of sadness and terror experienced by people trapped on the dead-end thrill ride that has come to be known as “the human condition”. The massive 490-acre amusement park will be located under downtown Detroit, Michigan. Among highlighted attractions slated to be built are eight extreme roller coasters, nine opera houses, a zoo featuring five of The King’s stock of minotaurs and a water park that will use over 666,000 gallons of tea for excited kids and parents to splash around in. The park’s main focus is on the recreation of King’s stories brought to life in Broadway musical reviews. These will run 24 hours, 7 days a week in nine 5000 seat opera houses located throughout the lot. Another major attraction will be a magnificent, centrally-located gothic carousel for children and parents to enjoy. A park cast member, playing the role of the infamous character O’Brian, will welcome families onto one of the steeds while they are whimsically whisked away to portray one of the heroic black horsemen. Then they will be encouraged to interact in the story by killing Baby Abigail. The project is expected to employ over ten thousand out-of-work carnies and jump start the bankrupt city’s economy by creating the largest man-made themed tourist destination in the world. Early promotional events will include “Nuns Have Fun Day” where nuns get in for half price and are allowed a day long bottomless cup of “Melissa Slurpies”. Affordable family packages that, according to the park brochure “won’t cost an arm and a leg…just a soul”, will go on sale next month. 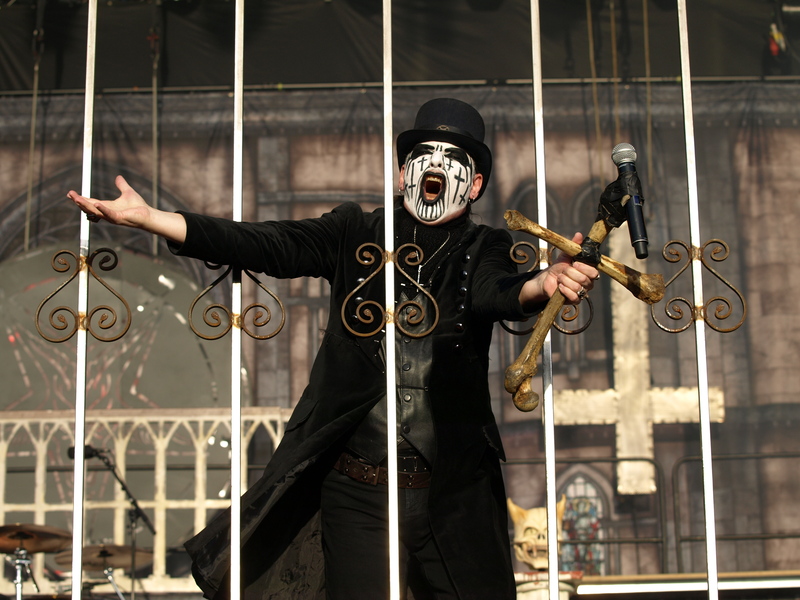 Have you ever found yourself singing the chorus from a King Diamond song at an inappropriate time like in church or at a funeral? Do you ever wake up with your face covered with strange painted designs without knowing how they got there? Do you ever find yourself having bizarre urges, like making furniture out of the leg bone of your neighbor? If you answered yes to any of these questions, you may be one of the nearly 2 million Americans who suffer from King Diamond’s disease. You are not alone. 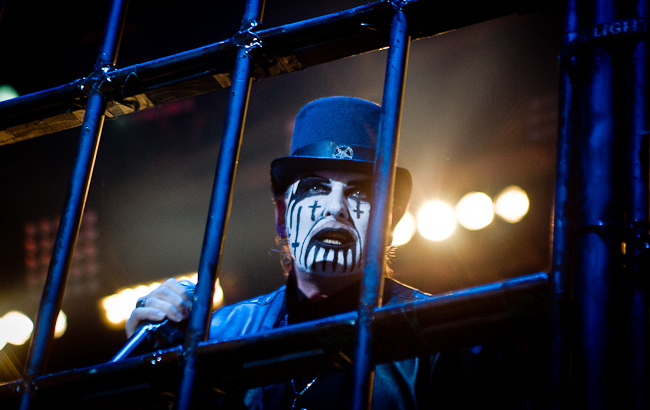 King Diamond’s Disease, known to doctors as Bendixitis, claims nearly a thousand new victims a week. You may see many of these poor souls on the streets, covered in backwards crosses, wandering aimlessly while singing the falsetto chorus to Abigail. They often struggle to maintain normal lives. They are your doctors, your teachers, your lawyers and your children’s crossing guards. I know their pain, because, you see, I am one of them. My story isn’t different from most KDD survivors. It started innocently enough. I’d be in the car on my way to pick up the children from their Tae-Bo class and catch myself howling “Sleeeeeeeplesssss Niiiiiiiightssss” for no reason in particular. I’d find myself thinking about the King more and more each day. When I was eating dinner, I wondered what The King might be eating. When picking out clothing at a shopping mall, my mind would drift to what The King might think about the sweater I was trying on. Then, one day, I woke up for a critical job interview for the position of Chief Tagalog Translator at The United Nations. 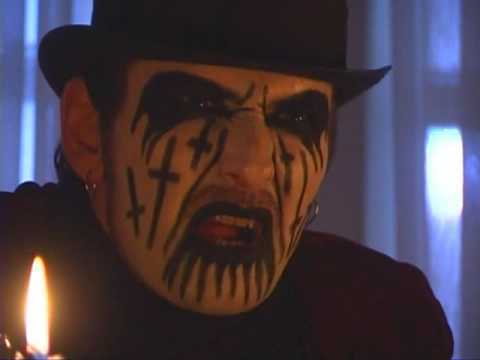 As I was putting the finishing touches on my outfit, I looked in the mirror and staring back at me was a 6 foot 2 stranger in a suit and tie with his face painted just like King Diamond on the Conspiracy album. I know that I hadn’t painted it myself! The paint would not wash off no matter what I tried. Imagine my pain and sadness, sitting in the most important job interview in my entire life, knowing that no employer in their right mind would hire a guy who showed up for a job interview dressed like a demented ghoul. They laughed at me. “Don’t call us, we’ll call you,” they sneered. They simply didn’t understand. 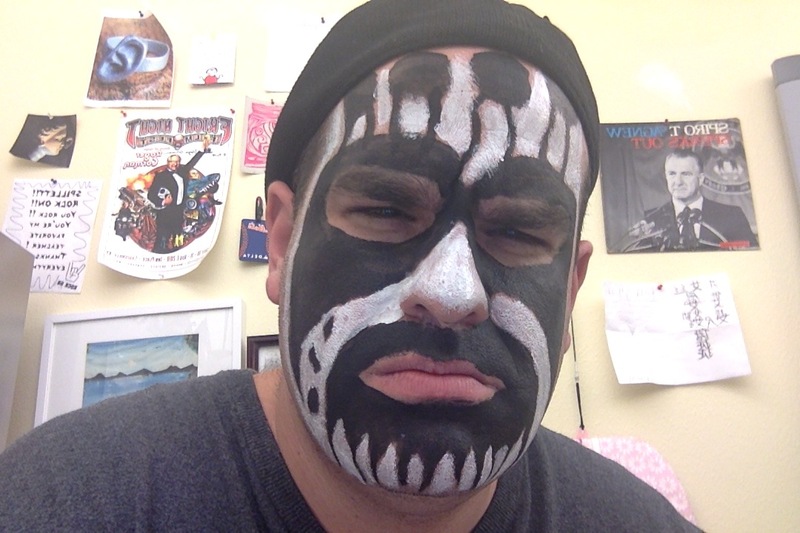 The face paint has never come off. It’s been three years now. I’m still unemployed, although I had a brief part time job as a greeter at Wal-Mart until I was fired for supposedly causing the store to be attacked by evil spirits. My children try their best to understand, but when the other kids make fun of them because their daddy is dressed up for Halloween everyday it hurts their feelings. The community has shunned me. I stopped going to church because they kept dousing me with holy water. Everywhere I go I am an outcast. 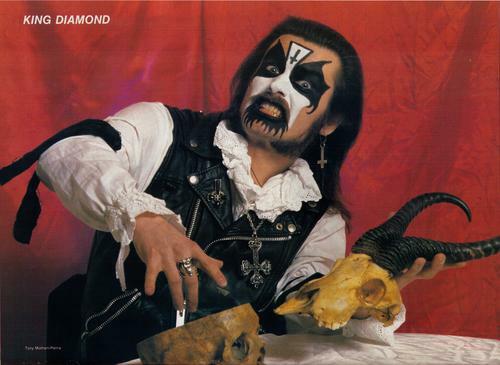 There is no known cure for King Diamond’s Disease. A diet low in orange sherbet can lessen many of the symptoms, but Bendixitis is a lifetime ailment that will never leave you once you have it. 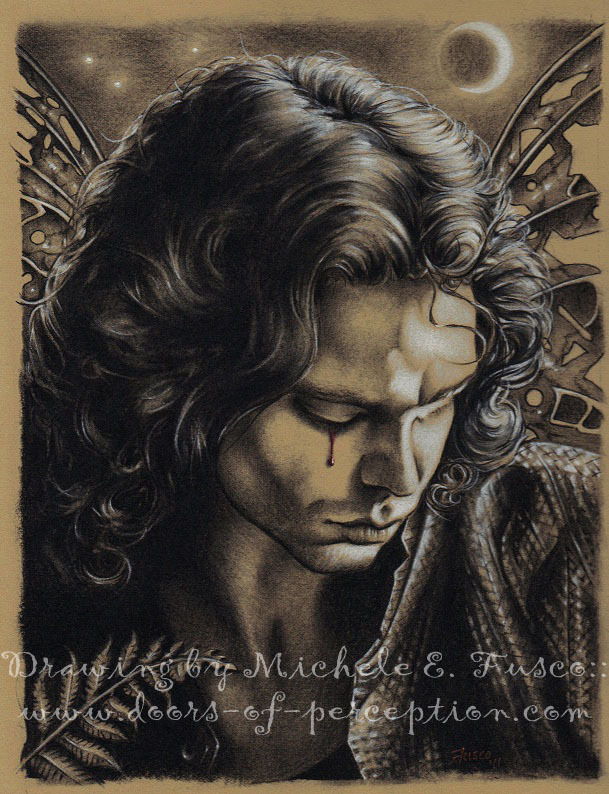 I have found strength in my support group Survivors of An Unmercyful Fate. We meet once a week and discuss how to live life one day at a time. I have met a lot of great people in the Atlanta area who suffer like me including my sponsor Joann, a kindergarten teacher who has lived with King Diamond’s disease since she saw the King on The Spider’s Lullabye Tour back in 1995. Her strength in going through her day trying to teach the alphabet to screaming, crying, terrified children is an inspiration to us all. With research and time, a cure might be found. 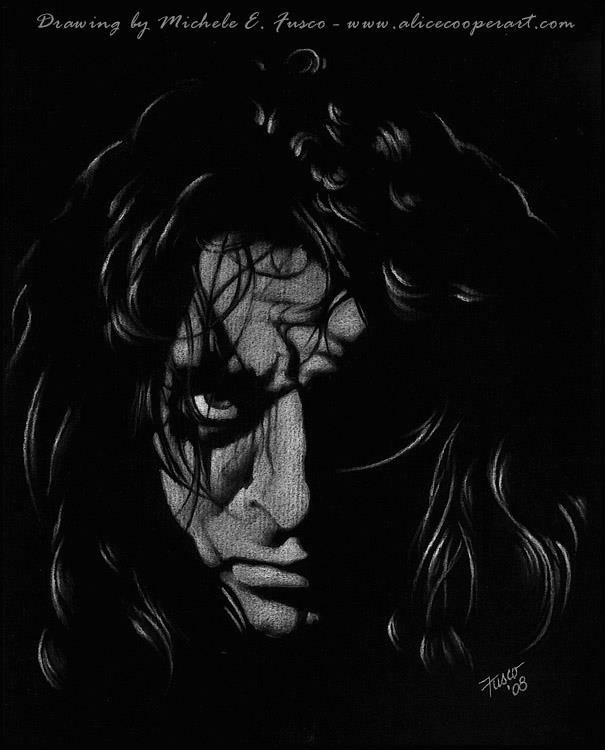 Until that day comes, I will wear my face paint proudly knowing that my “disorder” allows me to have something in common with the greatest vocalist ever to walk the earth. But still, I long for a day when I can walk down the street without old women cringing and middle aged men asking me to sing them a song about my grandmother.